MMS JULY 2018 70 mmsonline.com SWISS-T YPE L ATHES Seeing to be Sure Installing cameras in the spindles of a Swiss-type lathe can simplify the alignment of tools with the main and subspindles as well as the alignment of those spindles with each other. Misalignment can cause machining misfires. 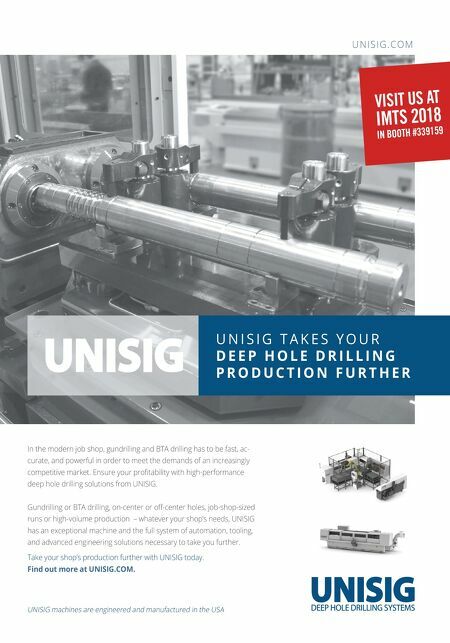 For Swiss-type lathes, it is important that tools on the gang slide are aligned with the main spindle's centerline and backworking tools are aligned with the subspindle's centerline to ensure accu- racy and prevent breakage of tools such as small boring bars. Similarly, the main and subspindle centerlines must be aligned with each other for accurate part pickoff operations. 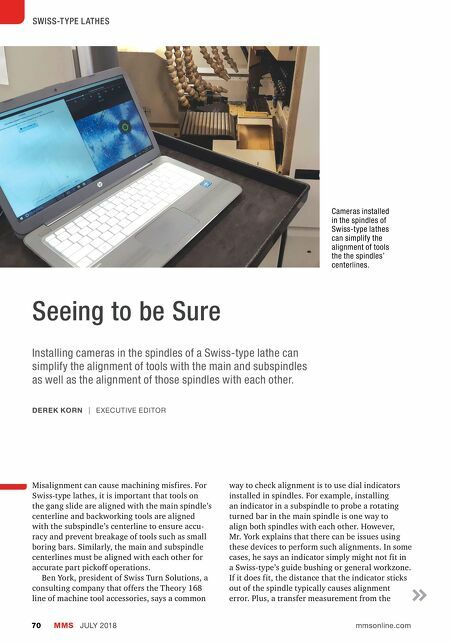 Ben York, president of Swiss Turn Solutions, a consulting company that offers the Theory 168 line of machine tool accessories, says a common way to check alignment is to use dial indicators installed in spindles. For example, installing an indicator in a subspindle to probe a rotating turned bar in the main spindle is one way to align both spindles with each other. However, Mr. York explains that there can be issues using these devices to perform such alignments. In some cases, he says an indicator simply might not fit in a Swiss-type's guide bushing or general workzone. If it does fit, the distance that the indicator sticks out of the spindle typically causes alignment error. Plus, a transfer measurement from the DEREK KORN | EXECUTIVE EDITOR Cameras installed in the spindles of Swiss-type lathes can simplify the alignment of tools the the spindles' centerlines.